Description: In my last post, I discussed a scenario where a client wanted to send e-mails to Business Portal users, and how Christina and I were able to lookup e-mail addresses in Active Directory with a SQL query. 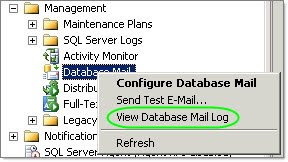 After executing this procedure, if you don't receive the test message, make sure to check the Database Mail Log by right mouse clicking on the Database Mail object in SQL Server Management Studio and selecting "View Database Mail Log" to try and diagnose the problem. So now, on to create a routine that can query a table, lookup e-mail addresses in Active Directory, and then send e-mails. I created a simple table called "Transactions" that contains a Username field, with values that match some test Active Directory users I setup. This sample T-SQL will query the Transactions table, get the usernames, and loop through the users, sending an e-mail to each. 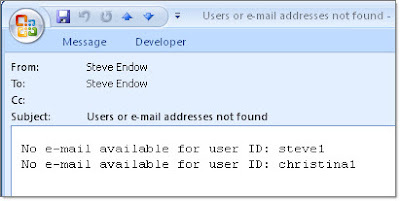 If any users are not found in AD, or if any users do not have an e-mail address setup in Active Directory, it will send an e-mail to an Administrator with the list of these users. I've highlighted in red some of the parameters that you will want to change for your testing purposes, and obviously you will want to edit the e-mail body text. So there you have it--a query against Active Directory to lookup e-mail addresses, and then send e-mails, all through a relatively simple SQL query.